Gregory G. Smith was a mathematical physics undergraduate at Queen's University, obtaining an M.A. at Brandeis University, and receiving his PhD.in 2004 at Berkeley under the supervision of David Eisenbud. For the next three years he was a postdoctoral fellow at Barnard College of Columbia University, before returning to Canada to accept a tenure track position at Queen's. Dr. Smith has already made significant contributions in Algebraic Geometry and Commutative Algebra. His joint work with L. Chen and L.A. Borisov, in which toric Deligne-Mumford stacks are introduced and their orbifold cohomology calculated, has already been used to resolve a long standing conjecture of Hibi on reflexive polytopes. Along with D. Maclaghan, Dr. Smith has proposed and explored the notion of Castelnuovo-Mumford regularity in the multigraded context. Dr. Smith's clarity as a teacher and enthusiasm as an expositor have make him a regularly invited speaker at conferences and workshops around the world. 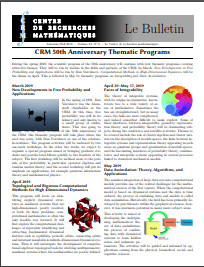 The CRM created and administers, either alone or jointly, four of the eight major national prizes in the mathematical sciences, namely: the CRM–Fields–PIMS Prize, the Prize for Theoretical Physics awarded in collaboration with the Canadian Association of Physicists (CAP), the Prize for young researchers in Statistics awarded jointly with the Statistical Society of Canada (SSC), and the CRM Aisenstadt Prize awarded to rising young Canadian stars, selected by CRM's Scientific Advisory Panel. The CRM has invested enormously in time, effort and in its own resources, to propel leading Canadian scientists into the spotlight, giving them international recognition when they most need it.